If you’d like to support the podcast (and you live in the US or Canada) then you can get a free audiobook if you sign up for a month-long trial of Audible’s service. Click here to discover more. From the author of “I, Claudius” comes the story of Justinian’s go-to General. Graves’ fictional account is based as much as possible on what we know did happen. Publisher summary: The sixth-century Roman Empire is a dangerous place, threatened on all frontiers by invaders. But soon the attacking armies of Vandals, Goths and Persians grow to fear and respect the name of one man, Belisarius: horseman, archer, swordsman and military commander of genius. As Belisarius triumphs in battles from the East to North Africa, his success causes him to become regarded with increasing jealousy and suspicion. 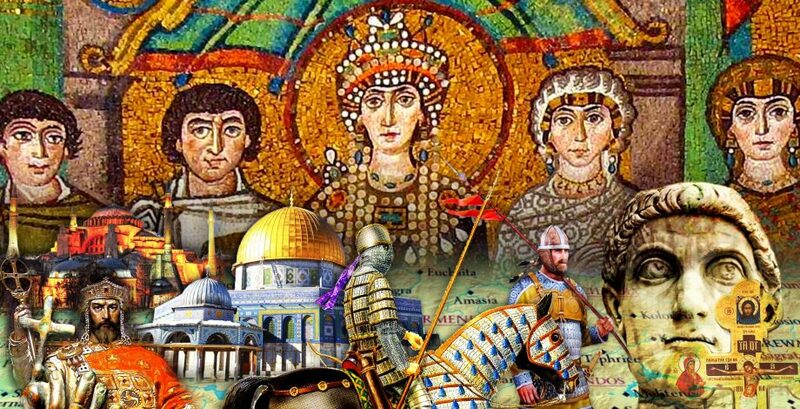 In his palace in Constantinople, the Emperor Justinian, dominated by his wife Theodora, plots the great general’s downfall. Written in the form of a biography by Belisarius’ manservant, this epic historical novel portrays him as a lone man of honour in a corrupt world. Recommended by a listener this is looser fiction set in 12th century Constantinople. Publisher summary: Constantinople, 1179. Princess Agnes of France is 13 when she marries the heir to Byzantium, an empire unmatched in wealth and power. But once she sets foot in the Queen of Cities, a decadent world where dazzling luxury masks unspeakable cruelty, she realises that her husband is a deluded mother’s boy with mighty enemies and treacherous allies. As emperors rise and fall, Agnes learns to play the City’s game – until she falls for a handsome rebel and finds that love is the most perilous game of all. Only when crusading knights from her homeland attack the City, does she finally understand what is truly worth fighting for. This is an exploration of the origins of Islam through the Christian, Zoroastrian and Jewish worlds it was born amongst. The stories of Justinian, Heraclius, Khosrau and others lead into the story of Mohammed and what we do and don’t know. Written with immersive language that assumes you have a grounding in the ancient world, it’s addictive but you may need to listen more than once. Publisher summary: In the 6th century AD, the Near East was divided between two venerable empires: the Persian and the Roman. A hundred years on and one had vanished forever, while the other seemed almost finished. Ruling in their place were the Arabs: an upheaval so profound that it spelt, in effect, the end of the ancient world. In The Shadow of the Sword, Tom Holland explores how this came about. Spanning from Constantinople to the Arabian dessert, and starring some of the most remarkable rulers who ever lived, he tells a story vivid with drama, horror, and startling achievement. If you think the swirling mysteries of Tom Holland aren’t for you then this might be. Understanding the source problems Hoyland puts together an entertaining and clear narrative of the Arab conquests from the beginning up 750. Publisher summary: In just over a hundred years – from the death of Muhammad in 632 to the beginning of the Abbasid Caliphate in 750 – the followers of the Prophet swept across the whole of the Middle East, North Africa, and Spain. Their armies threatened states as far flung as the Franks in Western Europe and the Tang Empire in China. The conquered territory was larger than the Roman Empire at its greatest expansion, and it was claimed for the Arabs in roughly half the time. This was the primary source for the biological speculation about the source and effects of the plague. It’s also where the Battle of Dara was most dramatically reconstructed. William Rosen shows the value of bringing other disciplines into the field of history by commenting on the Silk trade and the architecture of the Hagia Sophia in this fascinating, alternate view on Justinian’s reign. Publisher summary: The emperor Justinian reunified Rome’s fractured empire by defeating the Goths and Vandals. At his capital in Constantinople, he built the world’s most beautiful building, married the most powerful empress, and wrote the empire’s most enduring legal code, seemingly restoring Rome’s fortunes for the next five hundred years. Then, in the summer of 542, he encountered a flea. The ensuing outbreak of bubonic plague killed 5,000 people a day in Constantinople and nearly killed Justinian himself. This was a handy source for Charlemagne’s rise and coronation as Emperor. Heather is someone I trust as his book on the fall of the Western Empire is superb. This one covers Justinian, Theodoric, Charlemagne and others who all tried to restore Rome itself to its former pre-eminence. He explains what each contributed to the process that would eventually lead to the Holy Roman Empire. Publisher summary: Though each in turn managed to put back together enough of the old Roman West to stake a plausible claim to the Western imperial title, none of their empires long outlived their founders’ deaths. Not until the reinvention of the papacy in the 11th century would Europe’s barbarians find the means to establish a new kind of Roman Empire, one that has lasted 1,000 years. A sequel to the best-selling Fall of the Roman Empire, The Restoration of Rome offers a captivating narrative of the death of an era and the birth of the Catholic Church. This is one of my favourite history books. It explains so much about how civilisations developed from simple things like latitude, urbanisation and untamable zebras. Having done field work in New Guinea for more than 30 years, Jared Diamond presents the geographical and ecological factors that have shaped the modern world. From the viewpoint of an evolutionary biologist, he highlights the broadest movements both literal and conceptual on every continent since the Ice Age, and examines societal advances such as writing, religion, government, and technology. Diamond also dissects racial theories of global history, and the resulting work-Guns, Germs and Steel-is a major contribution to our understanding the evolution of human societies. LOVED the hardback release of Justinian’s Flea when it originally came out ( I wasn’t too lazy to read with my eyes then). But the narrator of the audio book is shockingly bad. It’s like the publisher never bothered to listen to it before releasing it. I HIGHLY recommend the book but I suggest reading it with your eyes rather than your ears in this instance. I’ve not read it, only listened to the audio book and I concur. The narrator’s slow, almost bored delivery made me consider “returning” it and asking for a refund. I stuck with it, and it’s a great book, and the narration gets less annoying, although maybe setting the audio speed to 1.5 or 2x may be needed. It’s a shame because the treatment of Justinian’s world is superb. The Audible reviews stomp all over In God’s Path. Hollands theories in the book have been bashed pretty badly by other historians. I don’t have the Audible account (I don’t think they work in Czechia), so I have just read the book, but for the very easy-to-read description of the eighth century Rome I would suggest Sister Fidelma’s “Shroud-for-the-Archbishop” (http://www.audible.com/pd/B00TP7YOOW/). It is a classical whodunit, but in this series term “classical” takes another meaning :).